I haven’t been doing nearly as much running since I’ve moved to Oregon, something I need to get back into, especially now that Lisa and I have registered for the Foot Traffic Holiday Half here in Portland on December 15th. However, one thing we have been doing in some serious hiking! In the last month we’ve gone on several pretty intense hikes. 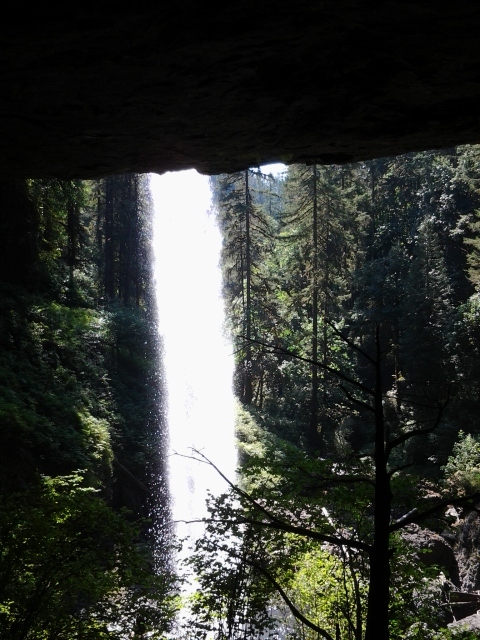 The first hike was on August 4th at the Silverfalls State Park near Silverton Oregon. The trail we hiked is called the Ten Falls Trail and is a long (approx 7 mile, we weren’t sure the exact distance) loop that passes by (you guessed it) ten waterfalls along the North and South Forks of Silver Creek. I have to say, despite the name “creek”, the water is very wide and very deep in parts and would certainly be what I would consider a “river”. It is small by comparison to the nearby Columbia and WIlliamette rivers, but a “creek” is something 2 feet across and ankle deep you can cross on foot (which we will later in this post!). Here is a map to the trail system at the park – MAP We started at the South Falls Day use area and took the Rim Trail east until we got to North Falls (we did not go all the way out to Upper North Falls, so we didn’t see all 10) and then followed the trail counter-clockwise to join the Canyon Trail which took us by 8 of the waterfalls (we also missed Winter Falls on the side trail in the middle) and then back to the parking lot area. This hike took us about 4 hours to complete and I felt really good the whole way, until the very end we had to climb some very steep stairs and then a steep uphill climb to the last falls which took the last out of my legs. The coolest part of this hike was that the trail went behind at least four of the water falls into caverns that had been hollowed out by the water. The parts of the rock that stayed behind is basalt from ancient volcanic eruptions. This is the view from the cave behind North Falls. The following Sunday, August 11th, we headed up to Mt Hood for our first Alpine hike. We drove up to the Timberline Lodge which is at around 5000 feet elevation and about halfway up to the peak which is around 11,000 feet. From our starting position on the south face of the mountain we headed west on the Timberline trail, which circles the entire peak at or around the timberline. Our destination for this hike was ZigZag Canyon, which we had read about in our hiking book and seen on the map, but we weren’t really 100% sure where it was. So we struck out and tried to see how far we could get. As the trail meandered along we would dip above and below the timberline and we would be for several hundred yards of rocky ground with nothing growing but sparse hardy wildflowers and then turn the corner into a dark thick forest of evergreen trees and moss, then emerge back out into a landscape that I can only describe as “lunar”. It was like hiking on the moon. It was so interesting to see where there was no top soil the ground consisted solely of small rocks, some as small as beach sand. We dipped into a canyon with a very small creek at the bottom that we could cross on foot, and we weren’t sure if that was the canyon we were looking for (if it was we were sorely disappointed) and so we continued up the far face and continued on. As we continued to wonder when and if we were going to discover the canyon we soldiered on. We turned a corner and we could hear water and looked down to see a strong rushing river several hundred feet below us but we couldn’t find the source of the water, and we hadn’t crossed another stream. As we debated whether it was emerging from beneath the rocks somewhere beneath us Lisa suggested that at the very least, we should continue up to the next large ridge we could see in front of us and see what kind of view we could get from there. We kept going and as we approached the edge of the ridge you could tell the ground dropped off sharply on the other side. A few steps from the summit as I was trailing behind Lisa I called forward to her “I have a feeling this is about to be amazing” and then as we stepped to the top all of a sudden the ground fell out from under us and we could immediately hear the roar of rushing water from the river below us. Now THIS was ZigZag canyon! We had found it! We stopped along the ridge for water and a snack and to enjoy the views before we headed back to the lodge. This hike was only about 4 miles round trip, but with some pretty severe elevation changes and what felt like “flat” trail on the way out to the canyon was actually a gentle decline as the canyon rim was several hundred feet below the timberline lodge, and so we had to regain all that elevation on the way back. The way out was smooth and effortless, the way back was a serious hike. 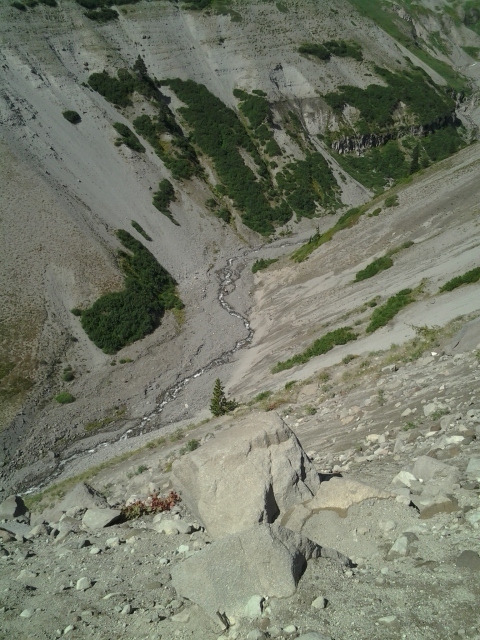 The pictures will never do it justice, but that “tiny” stream of water in the middle, is actually a large glacier fed river some 700 feet below where we were standing. The third in this series of hikes was the past Friday, Aug 30th and this time we headed out to the Columbia River Gorge area to the Northeast of Portland. Our intention was to hike from Wahkeena Falls to Multnomah Falls and then back. This would be an easy 5 mile loop. Multnomah Falls is the second highest year-round waterfall in the US according to the US Forest Service. However, the hike we intended is not the hike we got. Based on faulty directions we ended up starting our hike at the wrong trailhead. Lisa thought we could get to Wahkeena from the Angels Rest trailhead (and there may be a way but we didn’t find it) rather than from the Wahkenna Falls trailhead. So we set off from the trail and a couple miles in realized that things were not going as planned, but we continued on. Lisa was trying to remember landmarks and turns from a previous hike with some of her friends but was struggling to make the connections. 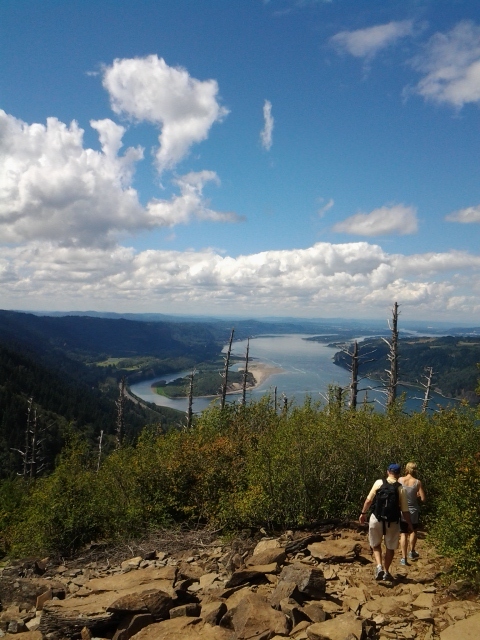 After several miles she finally realized we were headed not for Wahkeena falls but rather to the peak of Angel’s Rest. While this was not our intended destination, it was a still a very worthwhile goal. The exposed bluff about 1400 feet above the river gives a remarkable view of the entire Gorge east to west along the Columbia River than separates Oregon from Washington state. We left Angel’s Rest and continued on along the trail to the east towards Wahkeena falls and this is where things got interesting. First, we had a glorious walk through a wooded trail that was shaded and cool and offered more great views of the river and few hills as we walked mostly along the top of a ridge. Then the trail started to narrow and become overgrown and we were starting to wonder if we were still on the main trail or not. As we nervously debated about whether we should continue or turn around we came across a fork in the trail and a sign with a man standing there. We asked which way he had come and he told us he had come from Wahkeena Falls, which is where we were headed, and the fork led up to Devil’s Rest and straight ahead was the way we wanted to go. So we continued on, we saw a few more people, but this was very obviously a less used trail. We got to a point where we had to cross a much wider creek and there was a temporary bridge made of boards and logs that hikers had built after the original bridge got washed out. It was a little dicey but we both made it across. The trail appeared to go to the right and dead end and then continue on to the left. We went left and had just turned the corner when a barking dog suddenly ran at us which startled us both pretty seriously. The owners ran up and grabbed the dog and apologized and as we caught our breath they told us we didn’t want to go that way as it was seriously overgrown with vines and stinging nettles. We talked about where we were headed which ended up being where they had just come from and they said they would help us find the way. We headed back to the creek and along the path that appeared to dead end and then climbed under one huge log and climbed over another one and suddenly we were on the trail again. Without the help of our new found friends we would have NEVER found this trail. A short while later and we intersected a large major trail and it was the Wahkeena Return Trail #420, the trail we had been looking for ALL DAY! A short while later we parted ways with our new friends as they took a branch of the trail that headed out to Multnomah falls, which was part of our original loop, but now would have to wait for another day. We had already gone nearly 5 miles just to get to this point. Our hard work, some good luck and some saving grace would be rewarded handsomely though. The path we were now on started at the top of Wahkeena falls and worked it’s way down the side of the mountain in a series of steep switchbacks to return down to street level. The views were amazing each time the switchbacks turned back towards the falls, and the force of the rushing water pushed a blast of cold air in front of it that was like standing next to an air conditioner. Very refreshing midway through a long hard hike. I even stood in one of the smaller falls and very much enjoyed the cold water. We finally made our way back to the street level and the Wahkeena Falls trailhead and the end of a 7 mile fairly intense hike. 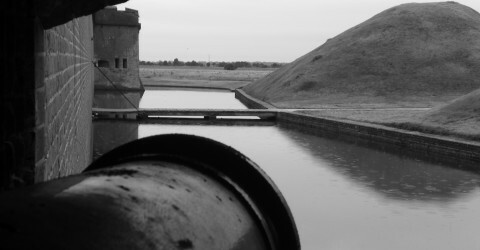 However, our adventure was still not over. We now had to walk along the road to get back to the Angel’s rest trailhead where we had parked. Consulting a trail map, it didn’t look that far and so we headed out. For both of us, this was the part of the hike that made us both nervous, even more so than the sheer drops off up at Angel’s Rest. We slowly approached the curves, unsure whether cars could see us and crossed the road several times to make use of a wider shoulder or a better angle to see along the curves from the other side. What looked like a short distance on the “not to scale” map turned out to be a little over TWO MILES. Taking the grand total of the hike to 9 miles and the last part was very much mentally exhausting. But the good news is, we survived to toast our accomplishment at the McMenamin’s Edgefield pub. Food and beer was very much the order of the day. One of our next future adventures will be to head up to Mt St Helens which famously erupted two weeks before I was born in May of 1980. Apparently the moon like terrain of Mt Hood is nothing compared to that. Lisa has told me several times “Just wait until we go to Mt St Helens”… well.. I can’t wait!